The Giants drafted Reynolds as an outfielder with a good, but not outstanding, hit tool and some power potential. Scouts have doubts, though, whether his approach will lead to much power as a pro, as he tends to hit the ball on the ground. He had some strikeout problems in his first pro season, but cut down on them some his second year, and he hasn’t walked much. He played center in college and has spent the majority of his time as a pro there, but his speed is below average and he’s probably marginal there. Scouts consider him a good corner outfielder. His arm is average. Reynolds hit well in his debut in the New York-Penn League, although with weak plate discipline. He got a mid-August promotion to full season ball and continued to hit well with poor walk and K rates. The Giants played him in center exclusively. Baseball America ranked him the fourth best prospect in the Giants’ system. The Giants moved Reynolds up to high A, where he split his time evenly among the three outfield positions. He hit well, but with only modest power and marginal plate discipline, although he did cut down on the strikeouts. BA ranked him fifth in a very weak system. Reynolds’ season got off to a rough start, as he suffered a hamate injury in his fourth game and had to have surgery. He returned in late May. Hitters don’t necessarily get back into form right away following hamate surgery. In particular, their power may take a half a year or more to return. Reynolds, though, came back strongly. After going 0-for-11 in his first three games back, he hit 316/398/456. The power was an especially welcome development; despite the injury and despite moving from the extreme, high-offense environment of the California League, Reynolds had only a slightly lower isolated power. He also improved his walk rate from .07 to .11, and cut his K rate a little. He played right and center in the four games before the hamate injury, then played left until Jason Martin moved up to Indianapolis. After that he played center. Reynolds made good progress in 2018 on the two most concerning issues with his hitting: power and plate discipline. He’ll be at Indianapolis in 2019. UPDATE: Reynolds got off to a very strong start in AAA and, when Starling Marte went on the injured list, the Pirates called him up. June 10, 2016: Drafted by the San Francisco Giants in the 2nd round, 100th overall pick; signed on June 22. 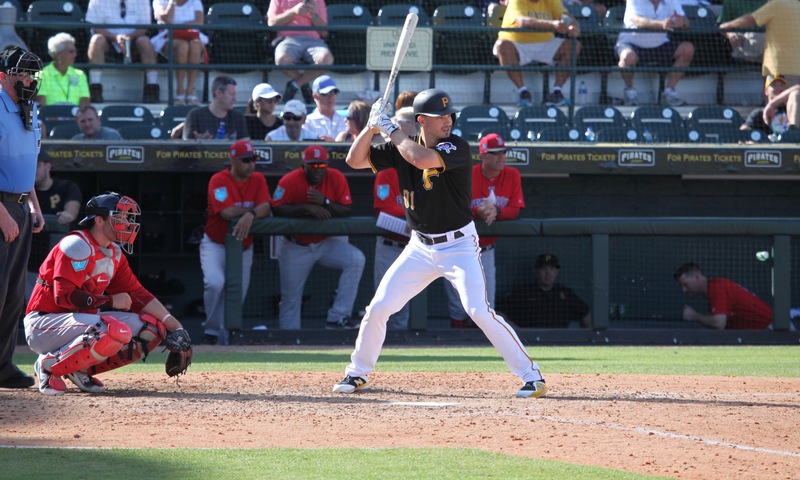 January 15, 2018: Traded by the San Francisco Giants with Kyle Crick and $500,000 in international bonus pool space to the Pittsburgh Pirates for Andrew McCutchen and $2,500,000. April 20, 2019: Contract purchased by the Pittsburgh Pirates. Pirates Prospects is an independent media outlet, and is in no way affiliated with the Pittsburgh Pirates, their minor league affiliates, Major League Baseball, or Minor League Baseball.